Sorry, I didn't see your question. I'm going to rebuild all of mine after the next official firmware release. No sense in doing them now, since official SA-1 integration must be coming and I'd just have to rebuild them all again once that drops. SD2SNES / Re: With SA-1 Games now playable..
Porting hacks to SA-1 gives a CPU boost to 10.4MHz vs the SNES's 3.58MHz, uses faster RAM for quicker loading, and offloads sprite handling to the SA-1 to have more sprites on screen and other tricks. Even if a game or hack isn't designed to use SA-1 sprite tricks, it still benefits from those hardware upgrades. In SMW SA-1 enhanced (regular SMW with just the SA-1 enhancements using Vitor Vilela's SA-1 Pack) for example, load times are nearly nonexistent and sprite-heavy scenes that ran at 15FPS now play at a perfectly smooth at 60FPS. I'm going to remake all of my themes once the next official FW comes out. Since it will take like a day to do, and I'd have to re-do them all when the SA-1 core gets integrated anyways. Yes, these will all be in the next update to the lists. I'm still working on the v6.1 update but it should be soon. Also, we're raising funds to help Vitor Vilela get an SD2SNES. Vitor is the creator of the SA-1 Pack tool suite used by all of the SMW romhackers, and he's basically the godfather of SA-1 hacking. He created the methods used for applying SA-1 chip enhancements to ROMs, and then made tools for others to apply the enhancements to their hacks. We've got $125 (of $203) raised. Just let me or F34R know if you'd like to help. It would be cool to see devs of these Super Mario World SA1 hacks somehow incorporate the chip into games that are notorious for slowdown like Super R Type. I'm sure there's a slew of games that could use the 10mhz and faster ram. Found several more SMW hacks today. I'll just keep updating the list as I track down more. SD2SNES / Re: It IS physically possible to emulate the SA-1 on the SD2NES! SD2SNES / Re: It IS physically possible to emulate the SA-1 on the SD2NES? I'll be live-streaming a first-look at the pre-release beta of the SA-1 core tonight at 10PM Eastern on Twitch. Thank you to Redguy for giving me the privilege of presenting it. I agree. It's actually funny to look back on my post from five years ago, because back then the Super UFO and Super EverDrive were seen to be competitors. These days, Super EverDrive and SD2SNES are really the only game in town. I was also much more assertive about things back then, while these days I'm much more open-minded I guess. 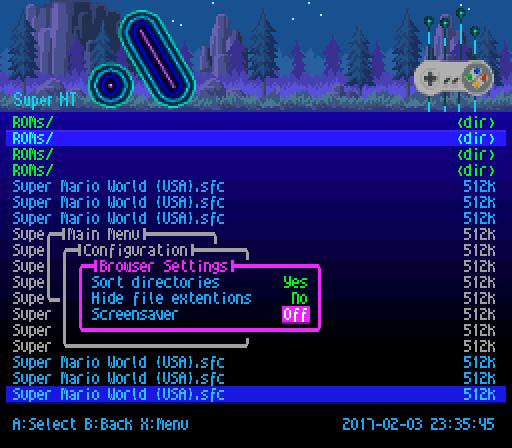 And, when I stop thinking of the Super UFO as a flash cart, and start thinking of it as a tool, it actually has a lot to offer. It still has some cool features that only it can do, and it's pretty cheap. You get the ability to dump carts and saves, and write saves back to carts. You can also stack a cart on it and play romhacks and translations from the actual cart. Some chip games even stack to play hacks, although that is pretty hit or miss. My Life In Gaming's overview is what really changed my mind about the old Super UFO. It's worth a watch, especially if you already own either a SED or SD2SNES, and have a lot of carts too. Basically, through the years I've become a fan of the Super EverDrive, the SD2SNES, and even the Super UFO.